For its season finale, the Fox television show Alcatraz filmed an elaborate reenactment of the famous car chase scene in the 1968 movie Bullitt. While the Alcatraz version undoubtedly has its differences, one being that the star of the chase is a Deep Impact Blue 2013 Mustang GT rather than a Highland Green 1968 Mustang Fastback, many of the same San Francisco streets and camera angles originally used in Bullitt are featured in the new chase scene. The episode aired earlier this week on Monday evening, but in case you missed it we have the entirety of the chase scene available for you to watch. Check out the Alcatraz chase scene and the 2013 Ford Mustang in action in the video below, and try and pick out the similarities and differences from the the original one in Bullitt. 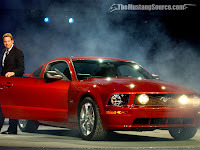 This entry was written by by MustangsDaily (Mustangs Daily) and posted here on Wednesday, March 28th, 2012 at 4:54 pm and is filed under 2013 ford mustang, 2013 mustang, alcatraz, alcatraz bullitt chase scene, alcatraz car chase, alcatraz chase scene, Videos. This article was not written by us, rather gathered using RSS feeds listed here. We take no credit for this article. You can leave a response, or trackback from your own site.